Raft1 is so much more than a rafting outfitter. We’re a true adventure center in the southeast, providing more opportunities for fun, fellowship and excitement, all at steep discounts when bundled together for large groups. These are some of the recreation opportunities your youth group can enjoy at Raft1. Mix and match rafting with any of these for the ultimate youth group adventure. Raft1 developed the first true zip-line canopy tour in the southeast. Our expert guides bring safe, exciting experience to a whole new level, literally! 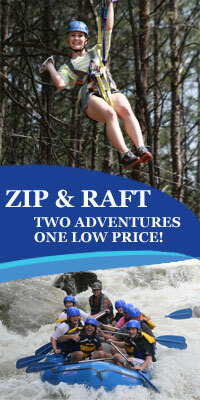 Choose a zip-line and rafting package to experience both in the same day! 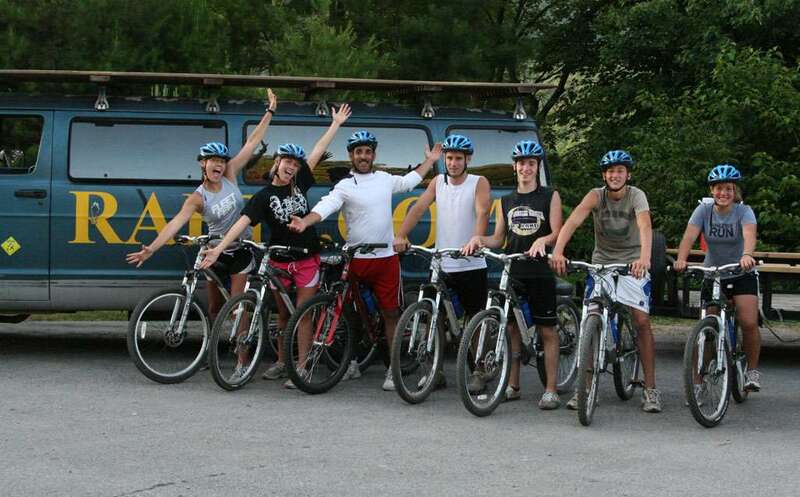 Raft1 is surrounded by miles of beautiful mountain-biking trails, from comfortable large group trips to demanding small group trails. You can get all the mountain bikes you need at Raft1, and all at a discount when you combine with a rafting expedition. Horseback riding is a favorite activity for helping to get group leaders and their young people out in nature at a comfortable pace. Combine horseback riding excursions with whitewater rafting for an unforgettable day on the Ocoee river. Raft1’s newest recreation opportunity pits your youth group participants against a challenging and fun ropes course designed to test their coordination and determination. Plan your visit with us this coming summer and make sure to include a round on the ropes course in your package. Your team will love the group challenges and team building! Reach out us directly at 1-888-RAFT-ONE to talk about what would make your Tennessee or Georgia youth group trip’s experience complete at Raft1. We’ll work up a package that fits your budget and your goals while sharing more fun, fellowship and excitement than any one-off local trip. Why Choose Whitewater Rafting for Your Group? Whitewater rafting is something most people don’t do every day or even once in their lifetimes. Many of your youth group members have probably never been rafting before, and they may not get the opportunity again. It’s an exhilarating, memorable experience that will make a big impression on the kids in your group. You’ll get to relive the experience when you recall stories of that day. When you head out for an afternoon or full day of whitewater rafting, everyone plays an important role in the experience. Your kids work together for a common goal, which makes the trip an effective team-building experience for your kids. The common activity can build trust within the group and help the kids learn about team dynamics. Some youth may emerge as leaders and develop their leadership skills while on the river. Heading out on the river is a shared experience that your kids get to enjoy. It gives them a chance to bond over a common activity away from the pressures of school and everyday life. They may learn to communicate better with one another and have a stronger connection as a group, which carries over to your normal group activities when you return home. Learning new skills prepares youth for real life. Taking the kids whitewater rafting is a great way to take learning on the go in a real-world situation. You get to take that learning to a beautiful outdoor location where kids can have fun and relax. Whitewater rafting gets kids out of their normal environment, so they can take in the beauty of nature. Kids who live in urban locations may not get much time away from bustling streets, buildings and concrete. This adventure helps them connect with nature in new ways. Almost everyone can participate in whitewater rafting, if the minimum age of 12 is met, even without experience. Kids don’t need to know how to swim, and it’s an inclusive activity that you can do as a group. A whitewater rafting trip is a big undertaking when you’re coordinating a group of kids, so planning early is key. Give yourself several months to ensure the trip goes smoothly. You’ll need time to figure out the logistics, so you’ll want those months to get the trip together. Don’t be afraid to pull in other adults to take on some of the planning responsibilities. Choosing a date early allows families to work the trip into their schedules. You’ll likely need to have the families’ complete paperwork for your records, so build in time to allow parents to return that information. It also gives you plenty of time to secure funding for the trip. Booking early is also important to ensure you can reserve a date that works for your group. Contact us as soon as you have a date in mind, so we can work on customizing the trip and securing those reservations — especially if you’re planning an overnight trip. You also want time to prepare your youth group members for the trip. While you don’t need experience to whitewater raft with us, it’s a good idea to talk about the things the kids will experience. Some kids may naturally get excited about any type of trip or experience you plan, while others may need a little nudging. Wherever your group members fall on the scale, you can help generate even more excitement in the weeks leading up to the trip. Announce the Trip: Make information about the trip widely known to both the kids and their families. You might make a fun announcement while dressed in a wetsuit and holding an oar. Posting fliers, sending home literature, emailing parents and announcing the trip on social media accounts also helps raise awareness. Continue Communication: Since you’ll likely announce the trip months in advance, you’ll want to continue communicating with the parents and kids. It’s easy to forget about deadlines for things like youth group trips. By periodically reminding parents, you increase the chances of them sending their kids on the trip. Schedule a Parent Meeting: No matter how responsible your group members are, they likely won’t communicate all information about the trip to their parents. Schedule a separate meeting for the parents to ensure they have the details they need. This meeting also gives parents the chance to ask questions about the trip. Let Kids Spread the Excitement: If you can get one or two influential members of the group to buy into the idea, they can take care of the rest. Those kids will talk about the trip to the other members and get everyone fired up to get on the river. Build Excitement: Talking about the trip enthusiastically makes kids want to participate. Continue mentioning the trip when you meet with the kids. The pre-trip activities are also a good way to make the kids want to go. Let the Kids Plan: Most youth group members are old enough to handle many of the planning tasks with a little guidance. Being involved throughout the process gives the kids ownership, which makes them more excited about the trip. You specialize in working with youth, but you also need a bit of financial knowledge to budget for the activities you plan. That doesn’t mean you need a degree in accounting to figure out the numbers for your whitewater rafting trip. You just need some time and information about the overall budget for the youth group. Before you start planning the trip, look at your group’s budget to see how much you have available for the trip. If you don’t handle the budget yourself, check with the person who crunches the numbers to see what you have available. You likely have a designated category in the budget for trips or teambuilding activities under which whitewater rafting would fall. Having an idea of the amount of money available helps you plan the details of the trip, such as how long to go, if you can make it an overnight trip, how many people can go and if you’ll need to fundraise. Calculating the cost of the trip involves more than simply knowing how much rafting costs per person. There are several extra expenses that go into the trip that you may not think about when you first start planning. Get an estimate of how many people will go on the trip, both kids and adult chaperones, to make other decisions. For example, if you’re taking a small group, you may be able to take a large van. If you have a large group, you may need a bus or several vans. Vehicle: If your youth group already has a vehicle that will work, you won’t have rental expenses. However, if you decide to rent a vehicle or charter a bus, you’ll have added expenses to consider. You may also need to hire a driver even if your group has a bus you can use. Gas: You’ll also need to fuel up that vehicle, so estimate how many times you’ll have to fill the tank based on the mileage from your location. Food: Decide how you’ll handle the food situation for the duration of the trip. We can cater meals for your youth group while you’re here to make the experience easier. Lodging: If you’re planning an overnight trip, you’ll also need to factor in the cost of overnight lodging. 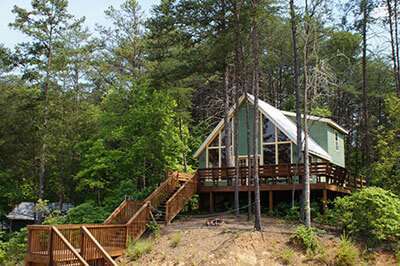 We have campsites and Bunkhouse Lodges to serve your overnight lodging needs. You’re going to have expenses associated with the trip, some that aren’t negotiable, but you can save money in some areas if you’re strategic. Specifically, you can customize your rafting experience to match your budget. The number of people you bring on the trip is a factor in how much you’ll pay. The more people you bring, the more expenses you have, but larger numbers can also benefit you financially. 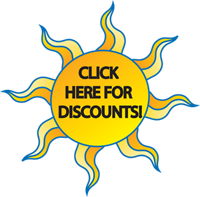 We offer group discounts, so bringing a larger group means you’ll pay less per person. Timing is another factor. Weekend and holiday rates are higher than weekday rates, so avoid those more expensive times if possible. You have the option of half and full trips. If your youth group budget is limited, you might opt for the half-day trip to save money. If you have extra wiggle room in the budget, consider a full-day trip with or without an overnight experience. The available budget for your youth group bank account is only one option for funding the trip. If your budget is tight, consider alternative funding options. You might ask each child who goes to pay a portion of the trip costs. Another option is holding fundraisers to cover the costs. Let the kids plan the fundraisers, so they can take ownership in paying their way to the whitewater rafting trip. How long will you stay with your youth group? Our on-site lodging makes it possible to turn your trip into an overnight experience. This option gives kids more time in the wilderness with additional experiences like building a campfire, setting up a tent and cooking their own meals. An overnight experience also gives the kids a sense of empowerment by being away from home in an environment that may push them outside their comfort zones. Good for local groups who can easily get to the river and back home. When deciding between an afternoon and overnight trip, your primary considerations should be the kids and the budget. Younger kids may prefer an afternoon trip so they don’t have to be away from home. Kids who have no experience outdoors may also feel better with a shorter day trip instead of camping outdoors. Community Involvement: A whitewater rafting trip encourages a sense of community. It encourages kids to be active and participate in an exhilarating activity while learning more about the area. Leadership: Success on the river requires cooperation to stay safe and achieve your goal of making it down the river. This success requires teamwork, but it also requires someone to take the lead to keep the team unified and working together. Our guides provide that leadership, but kids can also step up and take some leadership responsibilities on the trip. Outdoor Skills: A trip down the river teaches your youth group participants outdoor skills they might not have, especially if they live in the city. They learn about respecting nature, being safe and how to interact with plants and wildlife. These skills help expand the kids’ horizons and may be valuable in the future. Whitewater rafting can also encourage them to continue exploring nature and participate in other outdoor activities. Camping Skills: If you opt for an overnight trip, the kids in your youth group gain valuable camping skills. They learn things like how to set up a tent, start a fire and cook outdoors. Nature Observation: Whitewater rafting puts kids right in the middle of nature. They learn how to navigate nature safely while also enjoying the scenic background. Being in nature also fosters an appreciation for the world, which can encourage kids to take better care of our environment. Social Skills: Whitewater rafting is a group activity, which means kids need to work together and communicate. They may need to support one another if they feel nervous. Group Bonding: Your group will go through a unique experience that brings you closer together. Whitewater rafting is a great way to encourage group unity. A whitewater rafting trip can be an educational experience for you as a youth leader, as well. 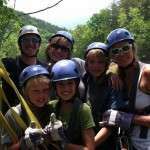 Experienced Guides: Our experienced guides make a day on the Ocoee safe for your youth group. We hire only the best guides who are professionals on the river. They know all the rapids by heart because they’ve been down them too many times to count. That experience is what keeps your group safe when you plan a whitewater rafting trip with us. Our seasoned guides will navigate your rafts down the river safely, so your group can focus on the thrill of meeting rapid after rapid on the Ocoee. Safety of the Rapids: Whitewater rafting on the Ocoee isn’t a slow, calm float down a river. You’ll encounter many intense rapids, which add to the experience. Many of the rapids are considered class III and class IV rapids. They’re challenging to maneuver, but remember — you have the best guides on the river helping your group through them. Additionally, the Ocoee uses dams to control the water levels. Safe Equipment: A huge part of safety in any activity is quality equipment. We use durable rafts made of extremely tough materials to stand up to the rapids you’ll encounter. Nine separate air compartments housed in an inner chamber remain safe from punctures so the raft stays inflated. The self-bailing design means you don’t have to worry about the raft being overloaded with water from those crashing rapids. No Experience Necessary: Whitewater rafting on the Ocoee requires zero experience. That doesn’t mean the trip is easy, but that you can rely on the guides to tell you what to do every step of the way. Your guide knows just what you need to do and when. All your youth group members need to do is listen carefully and follow those instructions quickly, and they’ll soon have their first whitewater rafting experience under their belt even if they’ve never encountered rapids prior to the trip. Call and Book, or Get More Info: First, call us at 1-888-RAFTONE (1-888-723-8663). Tell us the date you’d like to make a rafting trip and about how many are in your group. If you’d like more information, just ask! Deposits: When the time is right to book, we’ll need a credit card number and a 20 percent deposit on your chosen trip. That amount holds your reservation. We’ll need the full balance two weeks prior to the date of your trip. Waivers: Everyone riding on our rafts must sign a waiver prior to the trip. We also need a parent or guardian signature for minors under the age of 18. 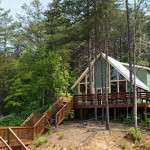 Click this link for Ocoee Rafting Waivers. Confirmation: At the time you place your reservation, you and our reservationist will set a confirmation date, which will give you time to organize your group and collect their payment. This date is normally two weeks in advance of your trip date. On your confirmation date, please call and tell us how many in your group have confirmed, and we will adjust your tentative number to a confirmed number. Cancellation Policy: In order to receive a full refund or reschedule, cancellations or changes must be made no later than two weeks before your trip date. You will be responsible for payment for whatever number you give us on your confirmation date. Real Catered Meals: Through the years, we’ve too often heard that the hardest part of a group-rafting trip is the food. So, we’re going to make this painless… We can have meals catered for your group, and usually for less than you‘ll spend shopping for groceries. Sending Checks to Us: When you send a check, please be sure to include your trip date, time and name under which the reservation is booked. Please write checks to: Raft One, P.O. Box 80722, Chattanooga, TN 37414.